I cause beautiful things to happen. Inspired by Employee Aaron’s quickie sketch in yesterday’s post, longtime customer Gary (creator of the infamous Frog by Day comic) generated a more fully-rendered version for the delight and amazement of all. I mean, damn, look at that. Who wouldn’t want to read that comic? And check out that elephant. That’s too cute for words, that is. • Another customer of mine, Jim Kingman, explores a bit of comics history regarding DC’s fantasy books of the 1970s and their distribution. • Did you know that internet pal Andrew is doing 28 Days of Jack of Hearts for the month of February? It’s totally true. And Bully the Little Stuffed Bull is doing 365 Days with Hank McCoy, the ever-lovin’ blue-furred Beast from the X-Men! • A few days ago I was going to say a few words about all that hoohar regarding alleged follow-ups to Watchmen , but Tom kinda beat anything I could add. Also, would still totally read that. • And don’t forget, I’m still taking questions in the comments for this post. Feel free to ask away! just wanted to tell you that I like the redesign of the site. 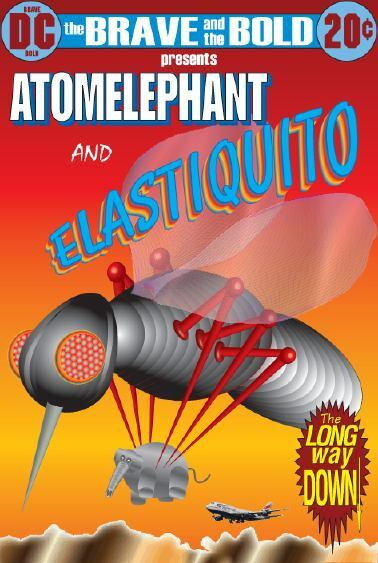 Bah, Atomelephant is like the Sentry of the pachyderm superhero crowd. Give me the mystery and magic of the Elephantom Stranger any day. Is it wrong to want to see a Bob Haney v. John Broome cage match over who’ll get to write this issue?